Where a dapper, durable evergreen shrub is required look no further than this handsome Viburnum species. Upright growing to 5′ x 5′ in 8 years it bears glossy deep green foliage held on cinnamon red stems and petioles. In spring intricate and tiny green flowers occupy a structure much like a tinker toy. 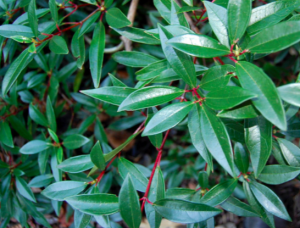 Moderately fast growing shrub for part shade to full sun. Much, much more graceful than the used and abused Viburnum davidii. Very good cold hardiness- to 0ºF. Long lived and always good looking. Regular summer water or very little once established.